Body image and eating disorders are not only widespread but the cause of high levels of burden within Western societies. However, over recent years, prevention, early intervention, and treatment options have expanded to address the complex presentations of these disorders, and the evaluation research for these approaches has also grown. Few texts draw together the wide range of evidence-based interventions in this field in a manner that can assist the health professional to choose and implement the treatment that is most likely to be effective. The aim of this edited text is to present practical information about evidence-based therapeutic approaches to facilitate appropriate intervention selection and implementation. Each chapter provides a theoretical rationale for an intervention approach, which is followed by a description of the evidence base for that approach. Each chapter then outlines issues in the implementation of the particular approach, highlighting its positive aspects but also dilemmas and challenges that may arise. Drawing on case material or clinical experiences, authors have highlighted practical issues that need to be considered, and additional practical clinical resources are provided. 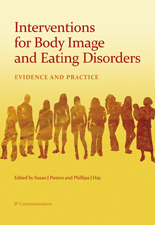 The book reflects notable advances in treatments for body image and eating disorders over the past ten years, including advances in prevention, psychological treatment techniques, pharmacotherapy, and treatment delivery approaches, and provides up-to-date guidance and tools for practitioners of all disciplines who work in the field. Published, May, 2009. 245 x 170mm. 400 pages. Paperback. ISBN: 978-0-9804586-3-3. $A75.00 rrp.